Discussion in 'Andy's Fashion Forum' started by jefferyd, Sep 8, 2008. OK I know it's been done to death, but I still feel that a lot of people (including in the industry, so don't feel bad) don't understand what all this canvas stuff is about. So here is my two cents worth about manufactured tailored jackets. Canvas is a slightly confusing term because it can describe several things; the wool canvas front used in full and half-canvas garments, as well as the stuff that is used in making a chest piece. So the sake of this post, I will refer to the soft-ish wool warp canvas which is found on the entire length of the front of a canvas garment as wool canvas, and is shown in blue in the accompanying diagram (assuming I get it up right). This is usually a wool warp with horse hair , cotton, rayon, and other things woven into the weft to give stability across the garment. There are several different types of canvas used in combination to create a chest piece, and in North America this is commonly referred to as hymo, wrapped hair and haircloth. This is covered in felt or domette to protect the wearer. If you have ever felt plasticy things sticking out of the chest of your garment, this is actually most likely real horse tail, which is a very springy substance used in haircloth to reinforce the chest and shoulder. The chest piece in my diagram is a light grey. Fusible (that dreaded stuff) is shown in red, the garment cloth is shown in dark grey. As you can see from the diagram, the front is fused, but not the lapel area. This is because the canvas will not extend all the way down the front and stopping the fusing half way would leave an impression. Those who sneer at the idea of fusing because of delamination have little or nothing to worry about these days- technology has improved greatly, and correctly applied fusing will not bubble. Improper application or overtly harsh treatment by dry cleaners may still be a problem, but it is extremely rare these days. The canvas front resembles a full canvas front except that it stops just below the pocket. This saves some time and material, but still providing the benefits of a properly padded lapel and stability in the front chest, right down to the pocket. The padding and bridle are done in the same manner as the full front and so is a decent trade-off when budget is an issue. Joseph Abboud, Coppley, some Jack Victor, among others. This is a technique that Hartmarx claims to have patented, but so many manufacturers do it I'm not so sure about it. 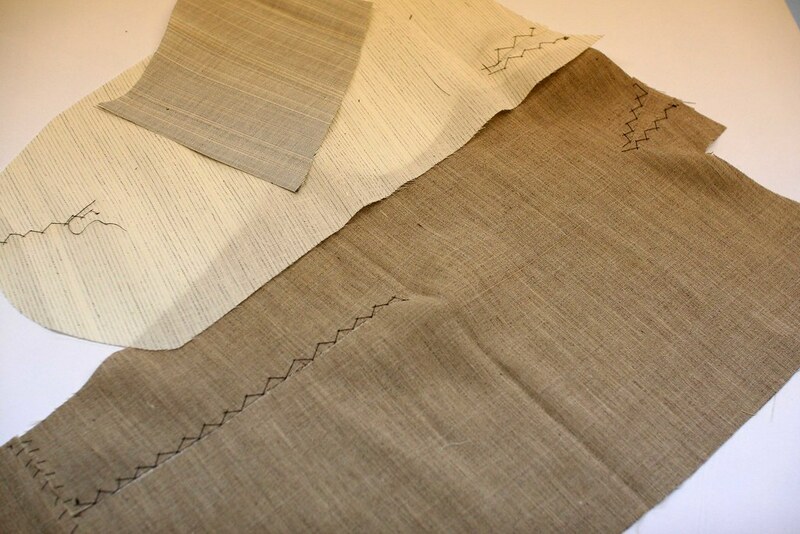 The fusible is the same as for a half-canvas garment, except the wool canvas in the shape of the lapel is inserted under the fusible along the rool line as it is being fed into the fusing machine. This is important because the chest piece does not have to be basted on to the front this way; the lapel is padded and then the chest piece is attached. There are variations, but most manufacturers use a technique like this to apply the chest piece; the bridle tape has fusible resin on one side- starting at the top, the 1" or so wide tape is applied to both the chest piece and the front- half inch on the chest piece and half inch on the front, fusing the first few inches of the roll line without pulling. The operator works heir way down the roll line, this time pulling for the next few inches to draw the roll line in, then fixing the last few inches without pulling. The chest piece is now attaced only at the roll line; the garment is flipped over, placed on a large press from which has a shape roughly like that of the finished garment, and the armhole is then stapled temporarily in place- using the form allows the operator to place excess faric where it is needed, to cover the chest, for example. 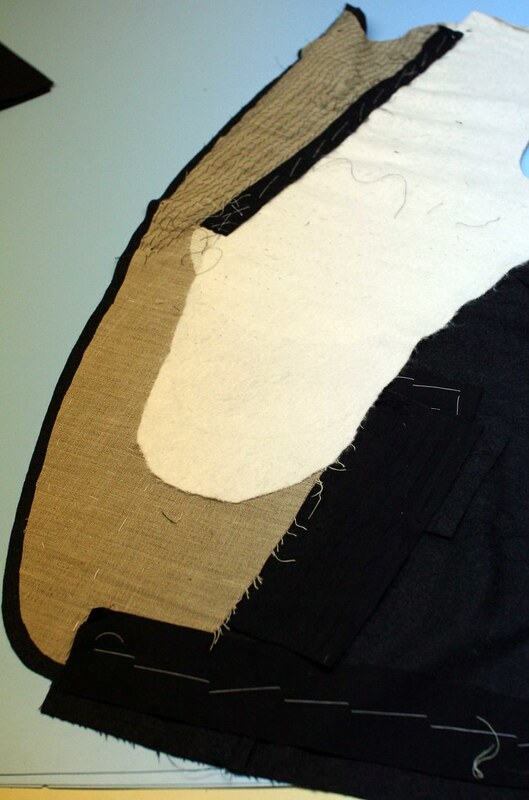 The armhole is then sewn in place through the chest piece, either all the way or only partly up the armhole. This unsexy method of attaching the chest piece eliminates the basting operations and makes it a simple operation to perform. This is a great time saver but there is one thing that I don't like about the way this is done by most makers; the canvas used in the lapel-only method is usually a LOT softer than the full or half-canvas method because in the first two, after pad-stitching, the seam allowances of the canvas are trimmed away by hand, a very time-consuming operation which avoids having the bulky canvas caught in the seam, making a nice thin edge. The canvas of the lapel-only version is usually left in the seam allowance to save the time required to trim it away and for this reason it has to be very soft; you then lose the great loft in the roll provided by a heavier canvas. However, it is still better than a flat fused lapel and gives a nicer roll to an otherwise more affordable garment. There is no wool canvas on this garment. The chest piece is applied to the front in the same manner as the padded lapel garment. Not everyone can afford canvas and its variations. No, let me rephrase. Comparatively few CAN afford canvas and its variations which is why there are so many fused garments on the market. I hope this is a little clearer now. If anyone is interested in seeing photos, let me know and I'll put some up somewhere. Photos would be great, though you should also post this in the Fashion Forum as well. a half-canvas jacket with no interlining or fusible or anything below the half-canvas - just empty space in there. do you have inside photos of a 1/2 canvas? i still cant see the advantage. as i said before i have never seen a half canvas. but if its true then i will believe. i never said it cant be done. just that it dose not seem practical. Question, though. I wasn't aware that 1/2-canvassed jackets had fusing in the chest as well as below. 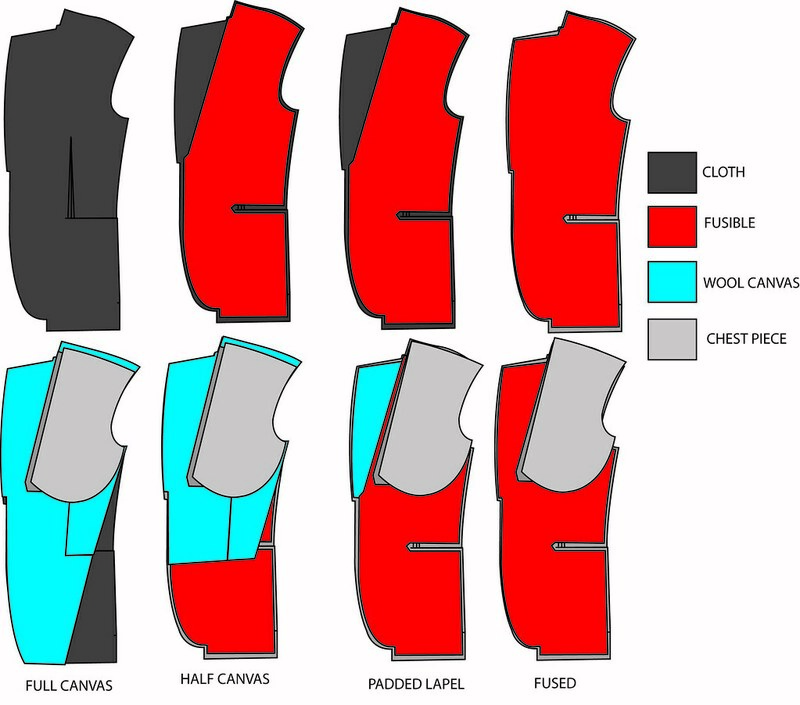 (On mine, I can feel the fusing under the garment front in the front quarters, but not in the chest area.) I now understand tailor's previous comments about having never seen a 1/2-canvassed jacket, only fused and full. If there is fusing in the chest, then what is the advantage of having canvas there as well, other than a padded lapel? It would seem it's still being given its structure (and stability) by the fusing and that you don't get the advantages of a basted canvas chest. Yes, your comments on this please. I believe A tailor holds that there's actually no such thing as half-canvas and what folks who think they have one are feeling is the chestpiece within the lining, not canvas. Well done. Please continue with more photos and additional information. I thoroughly enjoyed your post. Additionally, I would think a half canvassed chest peice would eliminate the possibleity of bubles in the chest area that remain possible with a fully fused garment. I recently had breakfast with a good friend of mine who was wearing a BB fused suit which had the bubbles. I realize technology has improved but if or when the bubbles come they are there to stay, and the garment looks awful. I realize technology has improved but if or when the bubbles come they are there to stay, and the garment looks awful. I've had good luck with using a water spray and a hot iron while holding the cloth quite taut. Believe it liquifies the fusing glue some and enables it to be reset when the iron's removed and the cloth cools. OK, Idea Biella is not until next week so I have a little time. First, some of the components ina canvas front. The small piece to the left is a 21 pick haircloth shoulder reinforcement- the dark grey is horse tail and is VERY springy. The larger white piece is wrapped hair- every other pick is horse tail wrapped in cotton. Still springy, but soft enough to use in the whole chest. The big piece is wool canvas. Hair from the mane, which is softer, is woven through the weft. No man-made substance has yet been able to recreate the natural properties of horse hair so even though it is very expensive, we still make suits with it. Once of the reasons we might use it in the chest and part way down the front is that fusing will never really provide the same support as canvas will. Here is that same canvas, in the front of a jacket. Notice how I have trimmed away the seam allowances of the canvas. I will late catch a tape in the front seam which I will then fell to the canvas, holding it all together. Also notice that the padding was done by hand. 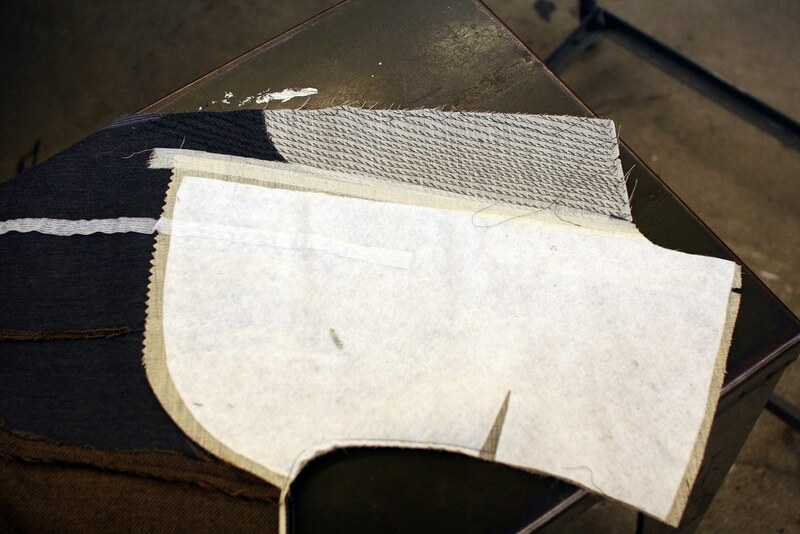 This is a fused garment with canvas in the lapel only, before being pad stitched. This is a similar garment with the chest piece applied. The pad stitching was done on this machine (this is one of a pair) Notice the roller over which the lapel is rolled as it is stitched. All automatic but very expensive. Now a photo of an old half-canvas garment I took apart. I don't like showing this one because it is not the best example- it does not go all the way below the pocket, in order to save money. However, notice how the canvas that is in the lapel is the same material that extends down the front and that it is in one piece. Aside from the benefits of having canvas in a large part of the garment, which gives better support than fusing, as I baste the cloth into the canvas, I will also tack the breast pocket, the dart underlay, and the lower pocket into the canvas- we like to have everything tacked together and in place so little moves- this way things hold their shape over wear- better garments are basted or blindstitched, lesser garments use glue which comes apart over time. On a fused garment I have nothing to tack the pockets and dart into so benefit #2 of half canvas. When fusing finally gained popularity, many people jumped on that wagon, and for a long time, it was quite true that your garment was either fused or canvas. Period. But after some time, salespeople and consumers became more aware of what they were wearing, and wanted something a little better. Whenever we can give features to a garment that a salesperson can talk about, be it bemberg lining, half canvas, padded lapek, hand finishing, whatever, it is a selling tool and they love it. The industry started to look at ways of providing a "best of both" garment, and teh half-canvas idea was born. To put it into perspective, a good canvas may cost $8 per meter; stopping the canvas at the pocket represents about a third of a meter of canvas, so let's say $2.40 per garment. 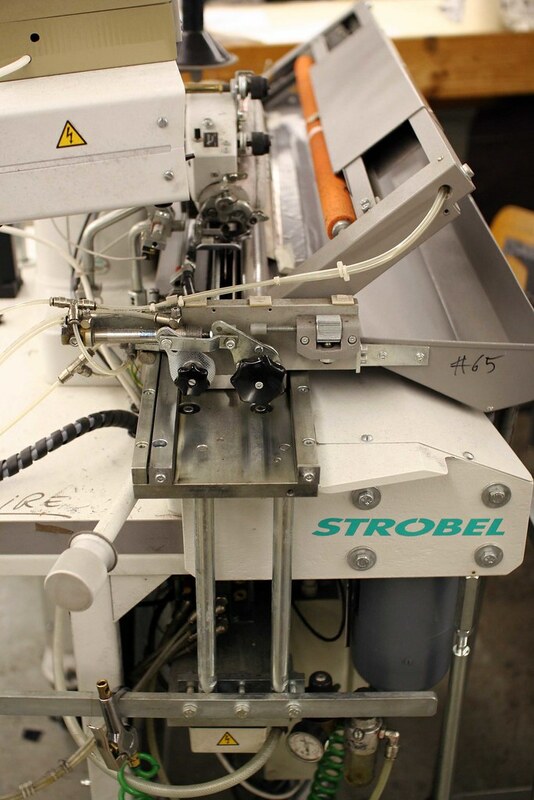 Samuelsohn makes 300 garments per day so that translates to a potential savings of $180,000 per year in canvas alone. Jack Victor makes 1200 per day so that translates to almost a million dolllars a year which can be saved just by chopping the canvas a little shorter. The industry counts pennies and seconds these days and every large factory has an industrial engineer with a stopwatch examining each operation to see if we can shave a few seconds, and thus dollars, off the bottom line. We used to only have each other to compete with, now China's muscling in......... So less canvas, less trimming seam allowances, less tape applied to the front, less felling= cheaper garment, but one that is still much better than a fused garment. As should be obvious by now, pinching a garment in the chest won't really tell you much, and pinching the lapel is not a failsafe way either. When looking at a garment, examine the underside of teh lapel for little pricks which would indicate pad stitching- on sportjackets you won't see this so it's not an entirely reliable method. However pad stitching only means that it uis a padded lapel, and not necessarily half canvas. Grab the front just below the breakpoint, folding it in half, and run your hand down toward the hem. If it is a half-canvas garment you will feel the very obvious spot where the canvas stops and the garment becomes a little softer or limper, you will also understand the difference between fusing and canvas. If it does not stop, it is either fused or full canvas. Pinch the lower front area and pull the front away from the facing- if there is a third layer in between, you have a canvas garment, otherwise it is fused. That or open the lining along the bottom and look inside- it can be very informative! About me- yes, a die-hard clothing junkie, but I also work in the business. 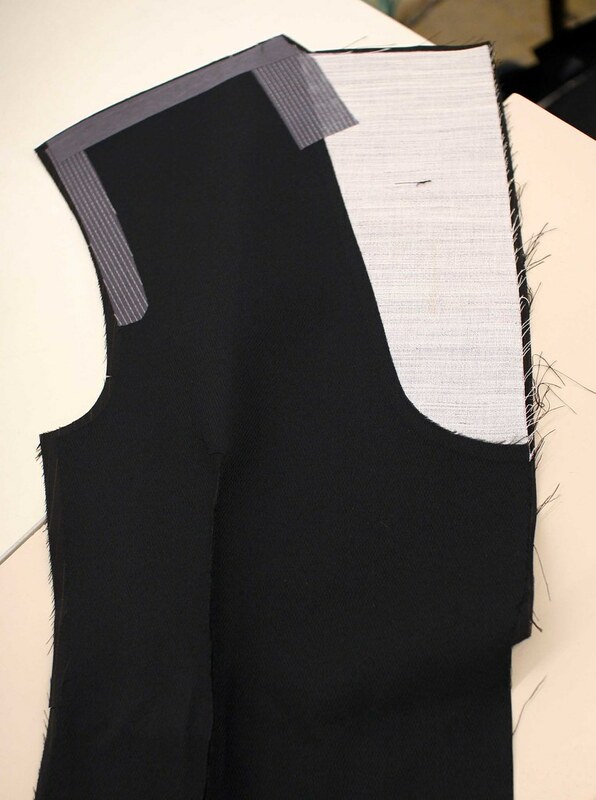 I am a designer for a manufacturer; this is different from a sportswear designer who will do conception only- a clothing designer also makes the pattern (or supervises someone who does), selects the trimmings and instructs the factory in the method of construction in order to get the silhouette, shoulder and quality level that he/she wants. I have worked for full canvas factories, full fused factories, and some in between so I have a pretty broad perspective on the industry and the benefits and drawbacks of different methods. And every once in a while I'll do some fully hand-made bespoke, but there is a far better living in RTW and MTM. One thing manufacturers might think about: if so many brands and lines of suits out there are NOT fully canvassed, it might be worth it to try making a fully canvassed suit at a competitive price as a way to differentiate themselves from the competition. Of course it would be a huge hassle to retool factories in order to do this, which is probably one of the reasons why North American factories aren't doing it.